Total enrollment increased to nearly 85,600 students across the University of Illinois System this fall, up 2.7 percent and rising to a record high for the sixth straight year, President Tim Killeen announced today. Combined enrollment at the system’s universities in Urbana-Champaign, Chicago and Springfield grew to 85,597 from 83,321 a year ago, based on enrollment as of Monday, the 10th day of classes. Ten-day figures are the traditional benchmark for enrollment among U.S. colleges and universities. Killeen said the gains are rooted in ongoing efforts to promote both affordability and academic excellence. Tuition for in-state freshmen was frozen this fall for the fourth straight year, the longest consecutive freeze in more than 40 years, and the U of I System has increased institutional financial aid from about $84 million to more than $219 million over the last decade. New initiatives also are underway to expand on world-class faculty and facilities across the system. “We are committed to opening our doors to more and more students, as we provide rich opportunities that transform lives and expand the pipeline of talent that drives progress for our state and nation,” Killeen said. Growth across the system includes a 2.9 percent increase among in-state undergraduates, from 44,655 to 45,955. The system has made in-state recruiting a priority, seeking to stem a recent out-migration of Illinois students to colleges in other states. Studies show graduates tend to stay in the state where they studied, so the out-migration is a loss for Illinois and its economy. Illinois students comprise over 80 percent of undergraduates enrolled this fall across the system. The U of I System also saw gains in enrollment of African-American and Latino undergraduates for the seventh straight year. Enrollment of African-American undergraduates increased 3.7 percent, from 3,898 to 4,041, while undergraduate Latino enrollment was up 8.5 percent, from 10,347 to 11,226. Combined, African-American and Latino enrollment comprises nearly 27 percent of the system’s undergraduate enrollment. More students each year also are identifying themselves as multi-race and this category, too, is showing growth, up 8.6 percent from 1,678 to 1,822 across the U of I System. The system is pursuing growth in total enrollment and among in-state and underrepresented students through initiatives created under its Strategic Framework, a roadmap that sets high-aspiration goals to build on its service to students and the public good. This year’s enrollment growth keeps the system on pace to meet the five-year goal of reaching 93,000 students by 2021. Graduate school enrollment across the system increased 4.1 percent, from 23,196 to 24,152, and enrollment of professional students was up 1.3 percent, from 4,121 to 4,175. Total enrollment of international students stayed relatively stable, increasing slightly from 15,345 to 15,350. 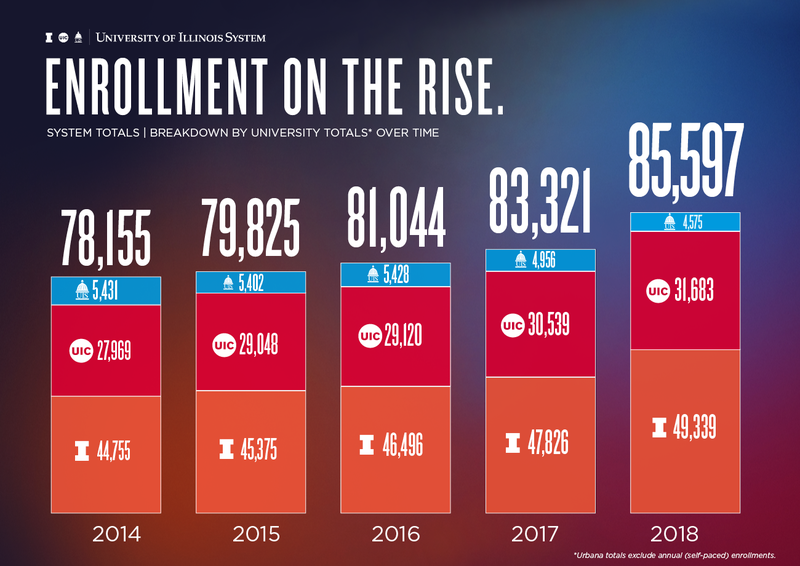 System-wide enrollment growth included a 3.7 percent increase at the University of Illinois at Chicago (UIC), where total enrollment rose from 30,539 last fall to 31,683, a new high for the fourth straight year. Total enrollment also increased 3.2 percent from 47,826 to 49,339 at the University of Illinois at Urbana-Champaign, setting a new record for the eighth straight year. Total enrollment was down about 7.7 percent from 4,956 to 4,575 at the University of Illinois at Springfield (UIS). In Urbana-Champaign, freshman enrollment increased 1.2 percent from 7,518 last fall to 7,609. African-American undergraduate enrollment increased 1.6 percent, from 1,973 to 2,005, and Latino undergraduate enrollment rose 6.8 percent, from 3,751 to 4,006. At UIC, freshman enrollment increased 2.7 percent, from a 4,050 to 4,159. Enrollment of African-American undergraduates increased 6.1 percent, from 1,534 to 1,628, and Latino undergraduate enrollment was up 10 percent, from 6,336 to 6,967. At UIS, freshman enrollment increased 13.7 percent, from 278 to 316. African-American undergraduate enrollment increased 4.3 percent, from 391 to 408, and Latino undergraduate enrollment dropped 2.7 percent, from 260 to 253.